As many of you know by now, Gingerbread for the DROID X and 2 was released over the weekend giving all of us a taste of Android 2.3.3 and the new blue Blur from Motorola, only there was one thing missing. Root access. Well, that problem has now been fixed by our friends over at My Droid World, and we’ve got full instructions for you after the break if you jumped on GB early. Yep, we walk you through every single step including flashing an SBF file which is something you won’t find anywhere else. In these instructions, you are essentially reverting back down to Blur build 2.3.340 and then re-upgrading to rooted Gingerbread. The process looks intense, but again, we outlined every step to help you get there. *WARNING* – You will lose everything on your phone by following the process. This wipes it all people. *WARNING 2* – This is NOT for the DROID 2. Those instructions can be found here. *Note* – If you didn’t jump the gun and flash the non-rooted version and are still running something like say, Liberty ROM, all you have to do is flash the .zip file below just as you would any other ROM. *Note Again* – If you have not already upgraded to Gingerbread, simply download the .zip file, flash it like you normally would a ROM, and ignore this entire process. 4. Plug your phone into your Windows PC and turn your phone off. 5. Boot into the bootloader by holding Volume Up + Camera + Power. 6. Your computer will likely install new drivers at this point. 7. 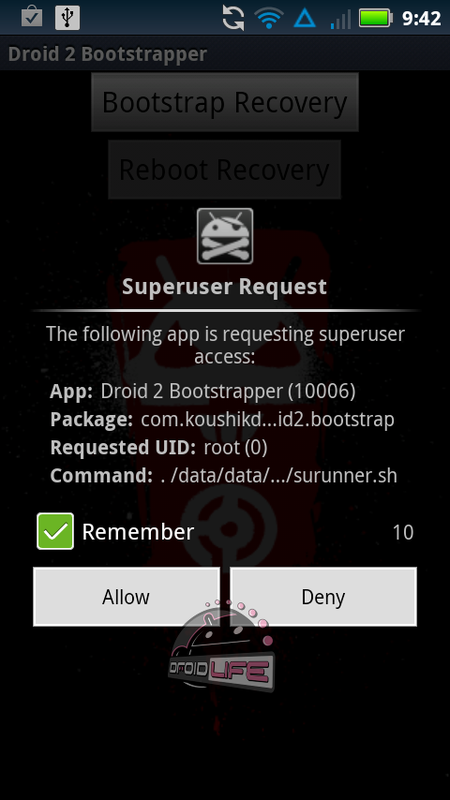 Once RSD lite recognizes your phone, hit the “…” box and choose the 2.3.340 SBF file. 9. When it finishes and gets to 100%, power your phone off. 10. Boot into recovery by holding Home + Power. 11. When the triangle appears, hit the Search button. 13. When it finishes, reboot your phone. 14. Download z4root 1.3.0 and root your phone. 15. Download DX Bootstrap and bootstrap your recovery. 17. Choose “install zip from sd card”, “choose”, then the dxgbrooted.zip. 18. Your phone will now install Gingerbread with root. 19. When you reboot, your phone will appear to bootloop. Let it. 20. If it does it for say, 5 minutes, just pull your battery and reboot. 21. To Boostrap after installing Gingerbread, you’ll need to use the D2 Bootstrapper.